PHOENIX, November 28, 2018 /3BL Media/ – With parties, decorations, gift giving and travel, Americans generate 25 percent more waste than average between Thanksgiving and New Year's Day – equating to almost 1,000 pounds of trash per household. However, roughly 80 percent of what is thrown away during the holidays can be recycled or repurposed, according to the U.S. Environmental Protection Agency. The experts at Republic Services, an industry leader in U.S. recycling and non-hazardous solid waste disposal, encourage consumers to incorporate simple environmentally responsible practices into celebrations and family gatherings to minimize waste. 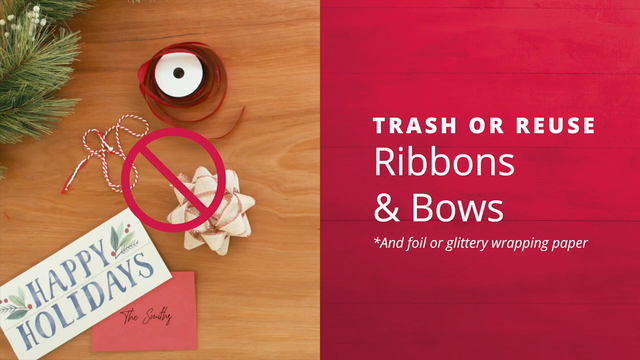 Save and reuse gift bags, ribbons and bows for next year – it’s smart for the environment and for your wallet! Shipping gifts? Make shredded paper out of old newspapers and magazines, or be sure to reuse last year’s bubble wrap and foam peanuts. Think twice when it comes to wrapping paper. Standard wrapping paper should be recycled, but anything with glitter or foil belongs in the trash (or save it for next year!). Generally, the fancier the wrapping paper, the less recyclable it is. Getting a new device this holiday season? Make sure your old phone or tablet isn’t tossed in recycling. Check with your local service provider for special instructions or electronics recycling options. Click here to view Republic Services’ new video showcasing simple holiday recycling tips. Common holiday items that do not belong in recycling include: bubble wrap, cellophane, holiday ribbons and bows, batteries, food waste, clothing and shoes, holiday lights, electronics and foam packaging. All of these items and materials should be placed in a waste container, not recycled. Additionally, toy packaging made of heavy cardboard is only recyclable when the cardboard is separated from the plastic. This includes the plastic window on the box of a doll or action figure. Sticky gift tags are not recyclable by themselves, but they are acceptable if affixed to an envelope or wrapping paper. Check with your local service provider to ensure you are aware of any changes in holiday collection schedules and how to properly dispose of real Christmas trees. Know What to Throw – Paper and cardboard, metal cans and plastic bottles and jugs. With bottles and jugs, remember to keep the caps on. Empty. Clean. Dry.™ – When recyclables are compressed in the truck, leftover food or liquid can ruin perfectly good recyclables. Keep It Loose – Never bag or bundle your recyclables. Republic Services, Inc. is an industry leader in U.S. recycling and non-hazardous solid waste disposal. Through its subsidiaries, Republic’s collection companies, recycling centers, transfer stations and landfills focus on providing effective solutions to make responsible waste disposal effortless for its 14 million customers. We’ll handle it from here.®, the brand’s promise, lets customers know they can count on Republic to provide a superior experience while fostering a sustainable Blue Planet for future generations to enjoy a cleaner, safer and healthier world.